I have an old computer charger that is 65 watts and 19.5 volts. I cut off the connector to solder an xt-60 to it and there were three wires. The three wires were black, white, and blue. This power supply is grounded. Can someone provide clarification for which wires to use? What are you trying to power? More then likely that type of power supply will not work as a charger if that is what you are thinking. It may be used to power a charger but at 65 watts and the 19 volts most PC`s and laptops have a built in charger that this power supply just supplies power to. Will your charger take the 19 volts and how many watts does your charger put out this power supply may be too weak. What works best is a server power supply they are 12 volts and can be hooked in series to output 24 volts. The best way to find out is to use a digital multimeter. Do you have access to one? Three wires coming out of a power brick makes little sense to me. Can you post a picture? Hate to ask, but which cord did you cut, AC side or DC side? Blue = Sense - feeds EEPROM in laptop to control charging (approx. 1.5V when laptop is charging - likely very close to the white wire voltage when not plugged into laptop). If your plan is to use the DC voltage to power a DC input Lipo charger, 65Watts is only going to give you approximately 3.4 amps (Power = Voltage x Current)....not a lot to play with when charging Lipos. If that is enough current, use the black and white wires, cap the blue sense wire. However, I also suggest that you grab a DVM and test the lines for your self. Better safe than sorry. The first guideline that you should remember when modifying electrical equipment is to assume that the colour codes mean nothing. When people ask me questions and start citing wire colours I tend to think they should not be working on the equipment in the first place. Hooking things up by colour often results in damaged equipment. Some laptop chargers had a barrel plug and supplied around 19VDC to the internal power supplies of the laptop. However, these usually only had two wires in the DC cable. You need to check between all three wires with a multimeter in both AC and DC modes. A three-wire supply could be many things - multiple voltages, standby power control, chassis ground, or a center-tapped AC transformer that will toast up your charger immediately. 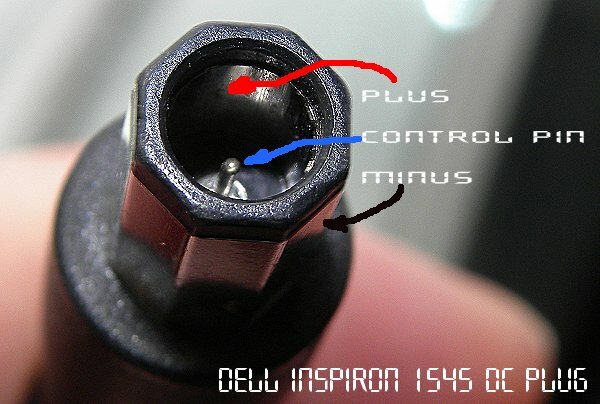 Is this the type of DC plug, bipolar with a center pin?